As it’s Sun Ra’s 100th birthday today, our Throwback Thursday is dedicated to the man from Saturn. Here, he speaks about his music and plays a few compositions including “Face The Music”. Many artists have helped mould the Sampleface aesthetic. Our logo is an obvious homage to DOOM and our strapline – “Face The Music” – is taken from Sun Ra’s song of the same name. Today is (and we say “is” because while he’s dead on Earth, he’s still jamming on Saturn) Sun Ra’s 100th birthday and seeing as it’s a Thursday, we decided to tie the celebrations with our TBT feature. 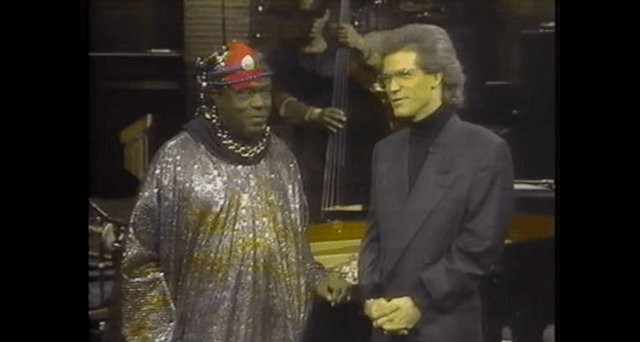 In 1989, Ra and his Arkestra featured on US late-night music show “Night Music” and the jazz master discussed his interplanetary conducting, how he was acquainting people with “outer space things” and how all musicians inspired him regardless of style. Listening to him speak, you get a sense that Sun Ra was above all the egos and crazed personalities of the industry and just wanted peace on Earth. We need more followers of his gospel right now. In the meantime, you can enjoy two of his fine masterpieces, Retrospective and Face The Music.